My new scanner-printer. I just bought it and am already upset with it. Ironically, this is the best location for it right now. The scanner takes an OK image, but I hoping for it to be a little clearer. My LC Super Speed is the closer one which also the older one. Mine is 1939, the other 1945. A good view of the lack of a segment, and also a good picture to show you all that barn-find patina. That is a very readable typecast! I have a similar Super-Speed that I restored. 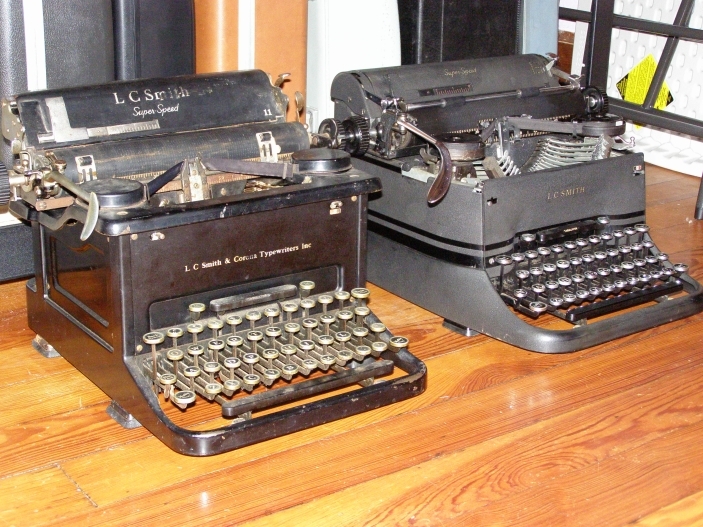 They are well-named typewriters, very good. i actually just had my printer/scanner installed yesterday. i nought it maybe 2 months ago but havent had the time to take it out of the box. i am lucky: my two very tech-savvy brothers were both in town and they had it installed with every feature working (except fax since i dont have a land line) in about 10min. 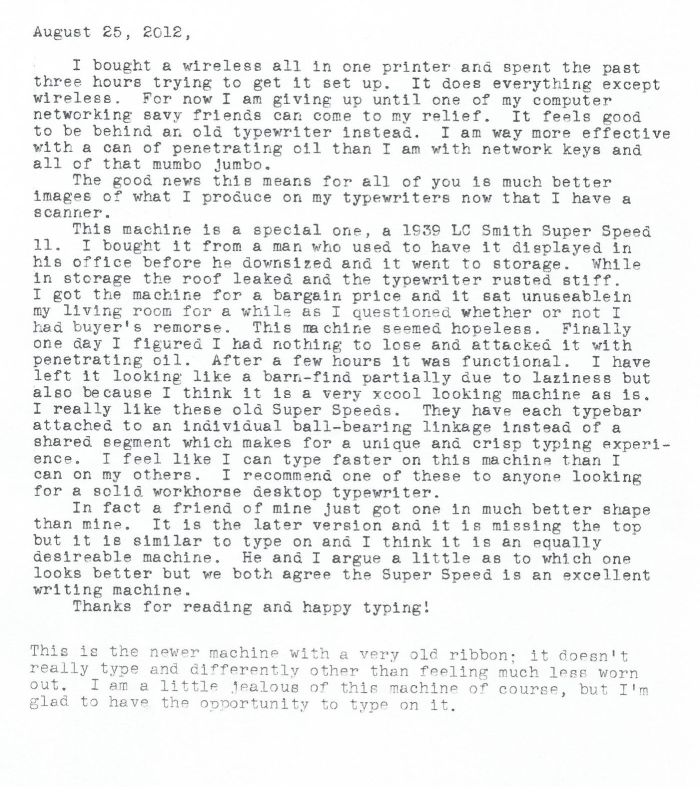 theres a superspeed typewriter available near me. she wanted $75 at first. and now its $40. only reason i havent got it is space considerations. maybe ill break down after all. If everything worked and I had $40 I would get another Super Speed. Just got a late 1940 Super Speed ( the Streamlined one) from a friend for 20.00. Not bad but it is filthy, and covered in dog hair - although that's easily enough fixed. 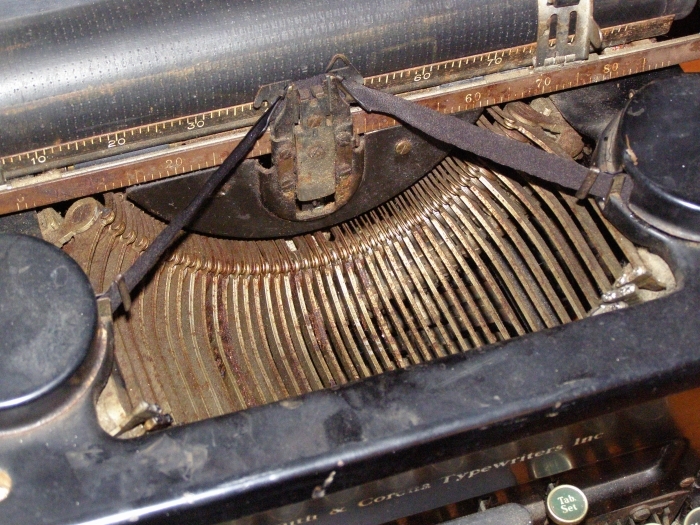 The problem is the huge pink, grey, and black herculon ( that nasty fuzzy 1970's couch upholstery material) mouse nest that fills the back of it, and is clogging up the escapement, so it won't move the carriage very well. But, oh well - pulling it out little piece by piece with a crochet needle. Finally got the carriage to move from right to left so I could see the serial #. One small step at a time!